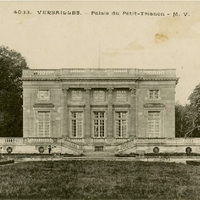 A postcard depicting the Palace of the Petit Trianon, part of a gift from King Louis XVI of France to his wife, Queen Marie Antoinette, in 1774. This haven, away from the rigors of court life, allowed her to entertain only those visitors that she pleased. The palace was part of a guarded and rural garden intended to allow her to return to a simpler life. Originally published by Marius Volpini. "Marie Antoinette's Estate." Chateau de Versailles. http://en.chateauversailles.cdv-lamp.msp.fr.clara.net/Marie Antoinettes-estate. “Palais du Petit-Trianon Postcard.” RICHES of Central Florida accessed April 23, 2019, https://richesmi.cah.ucf.edu/omeka/items/show/6617.